Growing up fast is the name of the game for GreenMountain.com. To keep up with investor expectations, the company will need to at least double its customers, to 200,000, in a year, Ellis predicts. The company began in 1997 as Green Mountain Energy Resources, a joint project of Green Mountain Power (GMP) and Texas billionaire Sam Wyly, who largely funded the company's start-up costs of $40 million. Wyly, a friend of Gov. George W. Bush, has made his money from a variety of interests, including oil drilling, silver mining, computer chips, hedge funds and arts-and-crafts stores. He has since invested roughly $100 million in the company. As power contracts such as the one with Hydro-Quebec hamstrung GMP, investing in a company that didn't stand to make an immediate profit was too much to bear. In the end, strapped for cash, GMP sold out its remaining share of the company for a mere $1 million. Since then, GreenMountain has signed up 100,000 customers in California, New Jersey and Pennsylvania. It is now preparing to market its products in Texas. New customers don't mean new money, though. In 1998, the company lost $45 million, and nearly doubled those losses in 1999. Despite those financial setbacks, Wyly's dream to build a capitalistic revolution based on principles of clean energy and a healthy environment seem to be taking hold. Without GreenMountain.com's customer base, three wind turbines in California, eight wind turbines in Pennsylvania and a proposed solar project in Berkeley, California, would not have been built. "We have made great strides in the green residential market, and now with our relationship with BP Amoco we will be putting that market clout to work in the commercial sector," says Ellis. "We think it's great for the company, and an investment of this size is a huge validation of what we're doing." BP Amoco will market the Green Mountain Energy brand of cleaner and renewable electricity to large-business customers, which represent about two-thirds of the power market. BP Amoco and Green Mountain will promote GreenMountain.com's solar-energy offerings using BP Solarex's solar products and services. GreenMountain.com will market its cleaner electricity products to BP Amoco service stations in GreenMountain.com's current and future U.S. markets. The companies will enter into cooperative energy supply arrangements that will enable GreenMountain.com to take advantage of BP Amoco's wholesale supply expertise, especially when it comes to natural gas. In addition, the company also announced that Lycos, the Internet's leading multi-brand network, would provide on-line marketing venues to GreenMountain.com. Lycos will also launch an Energy Center where GreenMountain.com will be the exclusive content provider. In a Web-cast of the announced alliances, GreenMountain.com CEO Dennis Kelly said BP Amoco's investment would allow the company to continue fulfilling its dream to educate consumers about the impact of their choices, and to build a profitable business based on environmentally friendly choices. As part of its agreement with BP Amoco, GreenMountain.com will help the oil giant place solar panels on the roofs of company gas stations. GreenMountain.com also helps to fund the placement of solar panels on schools, working with teachers to provide students with hands-on learning about alternative power sources. Even with its successes, GreenMountain.com has a hard time escaping criticism, thanks in part to Wyly. In March, Washington, D.C.-based Environmental Working Group reissued its call for a boycott of GreenMountain.com after Wyly dropped $2.5 million for a flight of pro-Bush ads before Super Tuesday elections touting the GOP nominee's record as an environmentalist. During Bush's tenure as governor, Texas air has actually become dirtier, leading to Houston's new rating. The first bill he signed into law in 1995 scrapped an auto-emissions inspection program for Houston and Dallas. In 1999 Bush backed a voluntary, rather than mandatory, approach to cutting emissions from industrial plants that had been "grandfathered" from the state's 1971 clean-air law. Other groups charge that Wyly and GreenMountain.com are trying to obviate the need for government regulation of power producers by hyping their brand-name success. The result could mean that dirty power plants remain in operation and renewables are only sold at premium prices to pay for the increased marketing. "They have not stopped the practices we've been critical of from the beginning, and whether they will change remains to be seen," says Wenonah Hauter, director of Public Citizen's Critical Mass Energy Project. Public Citizen is Ralph Nader's watchdog organization, based in Washington, D.C. Hauter's group issued a stinging 1998 assessment of green-energy marketers in California, and reserved special criticism for GreenMountain.com. "Whether we change that assertion depends on how they spend the money from BP Amoco. Are they going to use this money to actually build new renewables capacity, or will it go toward further marketing?" she asks. The push to develop renewable energy sources has generated more niche marketing, rather than the creation and development of less harmful ways to produce electricity, Hauter asserts. For example, of 75 to 95 percent of a $10 surcharge placed on monthly bills in California for "green" energy is used to cover marketing and overhead costs. Also, GreenMountain.com's California partnership with PacifiCorp may inadvertently keep one of the dirtiest coal-fired energy producing plants in the country running at full capacity. "Have the critics been proven wrong?" Ellis asks rhetorically. "It's still too early to make that claim. But we are making a difference. In all of the markets we're in, we are creating the demand to build new renewables. We are making it happen. That's what counts." Corporate executives at GreenMountain.com aren't always pleased when the deeds of their founding father are held up to the same standard as their green corporate goals. Once you dig beneath the veneer of Texas billionaire Sam Wyly's "compassionate capitalism," you can see why. Take, for example, the company's board of directors  dubbed "our strategic visionaries" on the company's Web site. The board is composed of Wyly; his son Evan Wyly, a managing partner of Maverick Capital, the family's hedge fund; Richard Hanlon, a director of Michael's Stores, a Wyly-owned business; Dennis Crumpler, a former executive at Sterling Commerce, a Wyly-owned business until earlier this year; and H. Lee Hobson, a partner in Maverick Capital. In the '60s, the Wyly family earned fortunes from oil refineries and mining. Over the past few decades Sam Wyly and his brothers have built a substantial empire from an array of publicly traded companies, including Sterling Software, Sterling Commerce and Michael's, a national chain of arts-and-crafts stores. One such store recently opened at the Staples Plaza in South Burlington. As with any corporate empire, it makes for some pretty cozy business relationships. In 1998 and '99, GreenMountain.com paid nearly $6 million to Sterling Software to install a data transmission network. Aside from the $40 million to get GreenMountain.com cranking, other Wyly-related businesses have invested in the energy company. Federal Securities and Exchange Commission filings show that Maverick Capital invested $15 million in GreenMountain.com immediately before last year's planned stock offering, giving it a roughly 11 percent stake in the company. Sam Wyly's daughter, Lisa, also expected to reap dividends from the sale and a small stake in the company. Several private trusts funded by the Wylys were also poised to gain a roughly 20 percent stake in the company when it went public. The SEC filings declared that the Wylys have no direct control over the investments of these trusts. Some of the money managed by Maverick comes from the University of Texas Investment Management Company. UTIMCO has been criticized in the Texas press for investing in companies owned by supporters of George W. Bush. As governor of Texas, Bush appoints people to this private commission, which oversees the university's $9 billion endowment fund. In 1998, UTIMCO placed $96 million into the hands of Maverick Capital, which at the time was a relatively new company. It's no secret that the Wylys are Bush benefactors. In March, Wyly's close relationship with "Dubya" got him into trouble when he pumped $2.5 million of his own money into ads that portrayed the GOP candidate as a friend of the environment  a claim many eco-activists refute. The past practices of BP Amoco are questionable, too. It has funneled millions of dollars to politicians who have historically rewarded large oil-company donors with legislation that thwarts environmental laws. During the 1997-'98 election cycle alone, BP Amoco spent $8.9 million on lobbying, and, with fellow oil giant Arco, made $1.5 million in campaign contributions, according to Ralph Nader's Public Citizen. For a fleeting moment last week, Vermont was home to the nation's leading e-retailer of renewable energy products and services: GreenMountain.com. With the announcement of $100 million in new investments from multinational backers, you could almost smell the paychecks. Printed on soy-based inks, of course. Then, as quick as you can say "dot-com," the company issued shocking news: Jobs wouldn't be added in Vermont, but rather in Austin, Texas, where the company will take up new digs this month. Texas makes the company more centrally located for its jet-hopping senior managers and directors, and places it at ground zero for when the Lone Star State opens its utility industry to competition this year. It also puts the company closer to BP Amoco, its new major investor. That multinational has a corporate presence in nearby Houston, a city that recently surpassed Los Angeles as the smoggiest metropolis in the United States. All but 10 employees are moving, confirms Kevin Ellis, a company spokesman and partner in the Montpelier-based lobbying firm Kimball, Sherman and Ellis. GreenMountain.com executives refused to talk to Seven Days about the company's past or future, forwarding all questions to Ellis. Fifty Vermont workers will be given the option to move with the company; the remaining two dozen or so will be receiving severance packages, Ellis adds. The handful that remains will staff the company's new markets, environmental and governmental affairs divisions  corporate-speak for public relations, marketing and lobbying. By keeping its "environmental affairs" division in Vermont, GreenMountain.com allows the company to promote, with an almost straight face, the "Green Mountain" name, and to keep what Ellis calls the company's environmental "conscience" rooted in Vermont. With the move, too, comes the company's third name change. It will become Green Mountain Energy in the near future. Hope, hype and happenstance is de rigueur for this infant corporation, which thrives on its oxymoronic mission statement: Use free-market economics to save the planet from pollution. 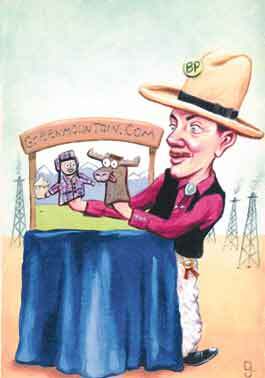 GreenMountain.com also relies heavily on Vermont roots in its marketing materials and public image, and for good reason: Tumbleweeds and oil derricks simply don't convey the same eco-friendly message. And in GreenMountain.com's business, image is everything. It exists on the premise that, given a choice, consumers will pay a premium price  as much as 10 percent more  to run their toasters and light bulbs with electricity powered by renewable sources such as solar, wind and water. Sales of renewable power comprise 10 to 15 percent of the nation's $200 billion energy market, and, as states deregulate, GreenMountain.com is positioning itself to capture a lion's share of that revenue. Most of the company's efforts are currently focused on individuals, which is about one-third of the overall energy market. Its agreement with BP Amoco will give the company access to the remaining two-thirds. Vermont, or at least its image, is a big factor in the company's success to date. A company profile on its Web site declares: "We're from Vermont, the Green Mountain state. We have a history of environmental commitment and a deep appreciation for the Earth. We recycle. We have compost bins in our office kitchen. We turn the lights out when the meeting is over." Another page on the site proclaims: "Vermont's a pretty special place. We are out here surrounded by nature. Trees and cows, mostly. It's a good place to go skiing. Or camping. A good place to get away and relax. A good place to think about what the Earth means to us." As a result of the company's move to Texas, Vermont Secretary of Commerce and Community Development Molly Lambert believes the lack of dominant connection to the real Green Mountains will be a difficult electron to spin to consumers. "Texas has held an energy brand for a very long time in the minds of consumers, but that has not been primarily one based on renewables," says Lambert, speaking of the Lone Star State's prowess in the petroleum market. That said, Lambert also understands why the company needed to move. "There are plenty of companies whose names do not reflect their geographic location. Patagonia, for example," argues Ellis. "I don't think that will be a problem at all." It's also important for the company to be in a state where the market is deregulated and employees directly interact with consumers. Texas holds that opportunity and Vermont doesn't. "The faster you can grow in Austin, the faster you can grow in South Burlington," Ellis adds.